After the S&P 500 sank 5.7% the week prior, this past week's tumultuous trading experience ended favorably higher. Triggered by an 8.5% overnight plunge on China's Shanghai Composite, U.S. stocks plunged on Monday, with the Dow Industrials initially falling a dizzying 1,089 points, the largest intra-day drop on record, before rebounding to end the week in the positive. In fact, through Monday, the Dow suffered its worst three-day loss on record, plunging 1,477 points. Mostly positive economic data however, helped drive a rebound as Tuesday's strong new home sales, up 5.4% in July, tempered the selling frenzy. Despite still intense volatility, investor sentiment improved as July durable goods orders rose 2% last month, topping forecasts. Thursday's impressive upward revision in 2Q GDP growth (3.7% versus 2.3%) also drew Wall Street cheers. Volatility again surged in the U.S. and abroad. The CBOE VIX volatility index surged 45% on Monday (rising from 28.03 to 40.74), before actually declining two points week-over-week. Benchmark 10-year Treasury note yields had traded to a low of 2% on Monday before rebounding to register an 18 basis point gain on the week, ending Friday at 2.182%. WTI oil prices tumbled as low as $38.24 per barrel before gaining 11.8% for the week. 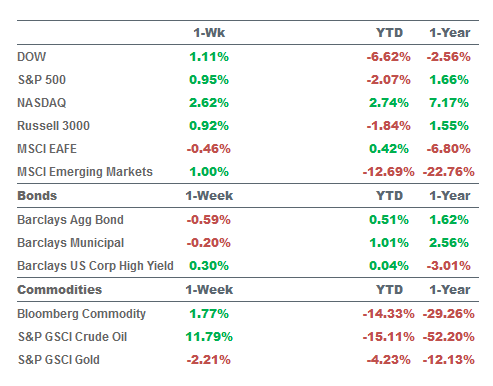 For the week, the Dow Industrials rose +1.17%; the S&P 500 gained +0.95%; and the EAFE (Developed International) fell -0.46%. Even if oil prices were to remain at its current level for the remainder of 2015, overall consumer prices will likely remain near the unchanged mark this year. According to a Bloomberg survey, should WTI crude oil hover around $40 through the end of the year, it will only put consumer prices further from the Fed's 2% target. The median projection of 24 economists is for a deduction of 0.3% from the average, year-over-year CPI this year, which economists forecast at exactly 0.3% in a separate survey. Separately, economists assigned a 65% probability that crude will stay around $40 per barrel through the end of September. Forty percent said it could stay here until the end of the year. 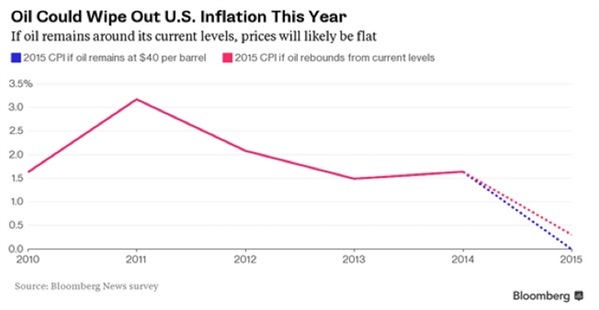 And it could get worse as one in three of the economists said oil will fall to as low as $30 a barrel.